This is a sneak preview of YDR.com’s new design, which will go up early on Tuesday morning. The York Daily Record/Sunday News’ site will share a design with the 90+ newsrooms that are part of the Gannett network. Also of interest: Web, mobile, tablet technology causes revisions in York, Pa., news media history. Bryan Sellers is the driving force behind giving native son and late Hollywood actor Cameron Mitchell his due. A recent event at Bethlehem Steltz Reformed Church showing the Mitchell film “All Mine to Give” was the latest effort in that regard. When a York Daily Record story about that event appeared on USA Today’s website, Sellers noticed the national recognition of this local Mitchell initiative in the Southern York County School District to fund a scholarship in the famed actor’s name. “They knew a great article when they saw one thanks to Barb Krebs,” he wrote in an email. The York Daily Record/Sunday News new partnership with USA Today – we’re both owned by Gannett – is indeed worth noting. This was a look at the York Digital Record, launched in a terrible blizzard in January 1996. The newspaper could not be delivered, so this platform, then under development, was rushed into the service. Its presence was advertised on local radio. That moment tied two big moment – this ‘newspaper’ of the future was launched on the 200th anniversary of the first known copy of Die York Gazette, the Daily Record’s oldest ancestor. Next week, YDR.com and York Daily Record/Sunday News readers will see other benefits, courtesy of our new parent. Digital readers – on YDR.com, FlipSidePa.com and GameTimePa.com and other mobile platforms – will particularly notice the enhancements. The websites will be easier to navigate and carry more photos and links to related content. And mobile users will notice more photos, photo slideshows and videos. These digital readers also will have access to select stories and photos from USA Today to add to the extensive local content on these sites. Starting Wednesday, newspaper readers will see USA Today stories as well, plus easier-to-read type. And I hope you’ve already seen an enhanced obituary presentation with larger photographs and a cleaner layout. Clearly, the Daily Record will remain a local newspaper, with our journalists gathering, writing, editing and designating where local stories will run on the front page and throughout the newspaper. These stories will be highlighted with visually creative designs, thanks to a Gannett studio in Louisville, Ky. There, national-level designers will ply their skills to enhance the present look of the newspaper. The newly designed pages will be digitally transmitted to York, where they will be burned onto aluminum press plates and then printed. So in this sense, you can say that what happens in York County stays in York County. You’ll still recognize the newspaper as the York Daily Record/Sunday News on Wednesday. This is not a complete redesign or makeover, such as we’ve undertaken at various points over the years. But I think you’ll like YDR’s freshened look. Much behind-the-scenes work is underway to produce the digital and print enhancements you’ll soon see. Gannett is investing in new computer systems to produce both newspaper and the website improvements. Of course, the York Daily Record, an organization that is more than 200 years old, has been through a lot of changes over the years. And that won’t stop. In 1815, William Harris took a defunct German-language title – Die York Gazette – and turned it into the English-language York Gazette. In the early 1890s, entrepreneur A.B. Farquhar invested a piece of his fortune gained from his farm machinery business into a 25,000-pound printing press that put out a red, white and blue 100th anniversary edition in 1896. And a couple of years later, the new machinery enabled the newspaper to start printing photos. In 1943, The Gazette and Daily converted from broadsheet to tabloid. Then, 30 years later, the newspaper went back to broadsheet – the general shape you see today – printed on a new offset press in a newly built suburban plant at 1750 Industrial Highway. And now we have new publishing systems that will take us far into the future. This was that 1796 German-language newspaper, run by the anti-Federalist printer Solomon Meyer. Solomon Meyer was at the helm of Die York Gazette for about eight years and then the newspaper went through a series of owners, stopped publishing for a period and came back as the English York Gazette in 1815. I’m not sure whether USA Today editors discovered the Cameron Mitchell piece on their own or whether we flagged it. So the moments we cover in York County might reach a new national audience via USA Today and Gannett’s network of 90-plus daily newspapers and their digital sites. Some community-minded people might gulp when a negative news story goes out on this network. 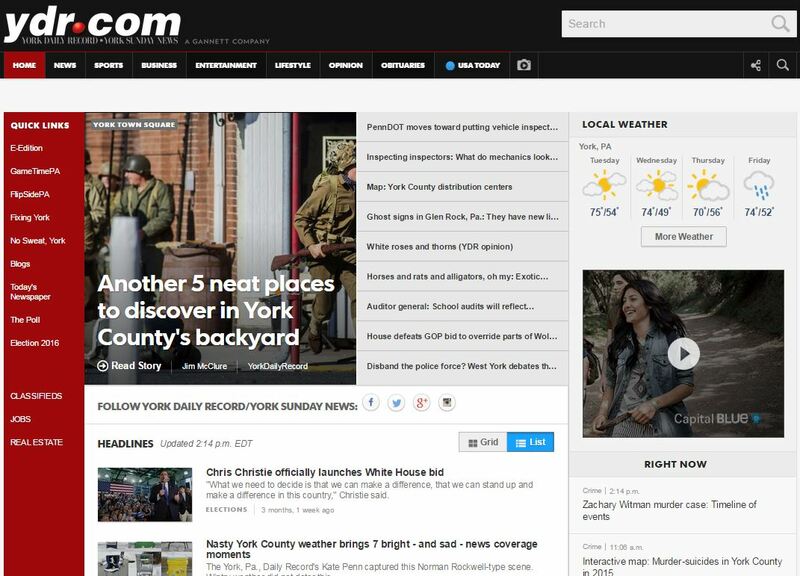 A search of other stories picked up by Gannett dailies shows that news about York County and its residents already are being enjoyed by new audiences across the nation and around the world. It tells about the Christian ministry of Sylvia and Keith Beatty, former York countians, in Arizona. So York County has the opportunity to show off, as it were. A gritty, grass-roots effort to underscore the screen talents of Cameron Mitchell can be recognized nationally for the good work that it is. In this sense, York County stories and photos reflect the flat world we live in today. What happens in York County does not stay in York County. This is a sneak preview – a mockup- of the York Daily Record/Sunday News’ new look, to be officially unveiled on Wednesday. It’s not a redesign or makeover, so the newspaper will retain the basic look that readers are accustomed to. But the design will be bolder and the type easier to read. For a refresher, here’s how the York Daily Record looks today – before the redesign.